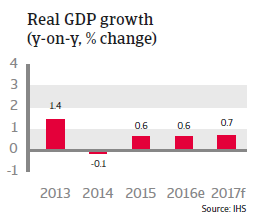 Japan´s economic situation remains lacklustre, despite the fact that since 2013 both the government and the central bank have launched a massive stimulus programme, including drastic monetary easing and several fiscal policy and public spending packages. 2016 was the third consecutive year of growth below 1%, and the forecast for 2017 is for continued subdued growth. 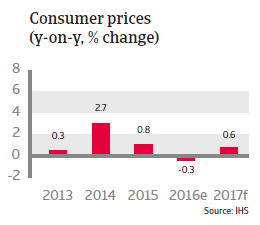 Deflation has returned in 2016 as prices continued to decrease, mainly due to a strong yen and low oil prices, while inflation expectations have remained very low. Despite a strong commitment to raise inflation to above 2%, the outlook remains subdued. While the oil price decrease seems to have bottomed out, this is not yet translating into real upward pressure on consumer prices in Japan. 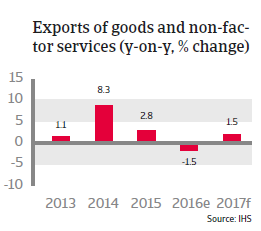 Instead, deflation has spread to other parts of the economy, like consumer goods, caused by the sharp appreciation of the yen against the USD in 2016 - despite the ultra-loose monetary stance of the Bank of Japan. 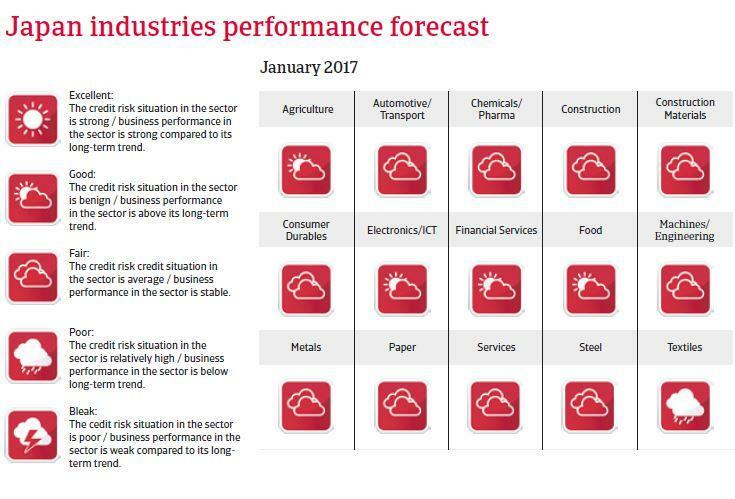 In 2017 inflation is expected to return to positive territory as commodity prices slowly recover, but only to an expected 0.6%. The yen appreciation was driven by the market perception that the yen is still undervalued and its role as a safe haven currency. That said, the trend has reversed with the outcome of the November 2016 US presidential elections, which triggered an appreciation of the USD at the end of 2016. 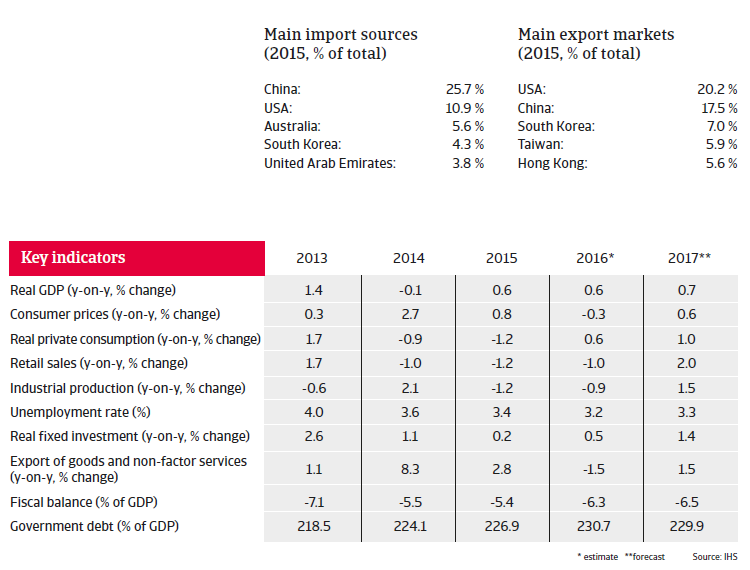 The US dollar is expected to remain strong in 2017, and this should help to increase Japanese exports and business sentiment in 2017. 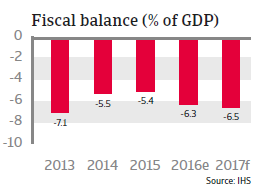 Following a long period of loose fiscal policy, the Japanese government is struggling with extremely high public debt (more than 230% of GDP in 2016). Japan relies mostly on domestic creditors to support its government debt (about 90% is held by Japanese investors), which makes the funding base less susceptible to capital flight. But maintaining this level of debt is costly, and further increasing government debt would at some point render it unsustainable. Japan faces some major challenges. Beside the high fiscal deficit, the country faces demographic challenges: the population is shrinking and the working age population is also declining. Without appropriate measures, Japan will inevitably face a shrinking tax base and rising expenditures on retirement benefits. Many industries already face some difficulties due to a lack of workforce, leading to higher labour costs and hurting their international competitiveness.